I Love My Park Day on May 5th had only four Friends show up and they left having done only a small amount of work. 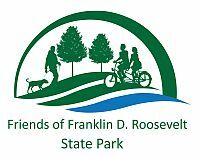 Recreational Trails Grant Program - Jane Daniels will contact Frank Mami about the progress being made distributing gravel. Signage - The park has intalled directional signs at trailheads and junctions. Zebra stripes on Route 202 - MArk Kotkin said he has contacted NYS DOT again and is waiting for a reply. Upcoming meetings. With no new project on the horizan, Jane brought up the subject of eliminating a meeting. Since she is not able to meet on July 11, she suggested that our Annual Potluck Picnic be held in August. All agreed and that since the July meeting was canceled, there needs to be a June meeting.